I thought this was the last post in this series… little did I know I would find more. Get ready for Post Number Five. 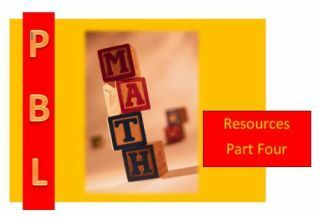 I hope these math resources provide you a further idea, a scaffolding lesson, footprint, or even an entire plan for a PBL unit. I am pleased to share with you these twenty-two site… plus more in the next post that I am certain can help facilitate Math PBL. Of course, I have many things I would like to discuss in regards to Math and PBL… but I will save that for a future post. I hope you enjoy these twenty-two resources (plus more) that are a part of this four (now five) part series. Is there something that should be added? Let me know! By the way after this next post… I have a brand new PBL Math resource that I am really excited to share. Please return, share, and provide a retweet.